Send your Mac clipboard contents to your iPhone over WiFi. Is there a better alternative to Pastebot Sync? Is Pastebot Sync really the best app in File Management category? Will Pastebot Sync work good on macOS 10.13.4? 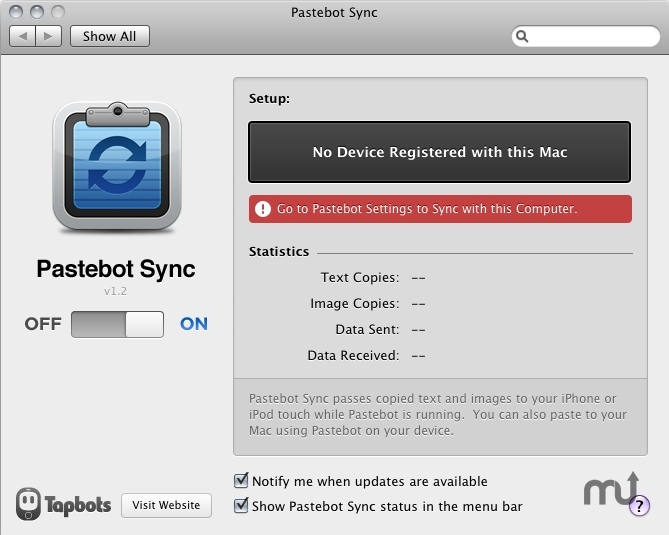 Pastebot Sync is a Preference pane companion to the Pastebot iPhone app. It runs in the background and magically sends text and images to your iPhone while Pastebot is running. Just copy something on your Mac and see it instantly appear on your iPhone. Getting content on your phone has never been easier or more fun. But it doesn't stop there. Pastebot Sync also allows you to paste items back to your Mac…from your phone! Have an image in your iPhone photo library that you want to send to your Mac? Just import it into Pastebot and then paste it to your Mac wirelessly over wifi.